A flash card app to help you learn Spanish or English. Publisher’s description: Spanish / English learning software. 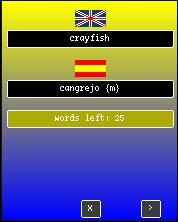 memoWords allows you to learn Spanish / English vocabulary with your mobile phone or PDA at any time. Now you can learn foreign words in a bus, train, underground, on board a plane (offline mode). Has some key mapping issues on both the Motorola Rambler and i776. Usable on the Rambler using alternate keys as a workaround. Not usable on the i776 as the arrow keys, which are the only way to navigate the menu, do not work. Keys: If the soft keys or the OK key don’t work use these alternate key workarounds: 5 = OK; 1 = left soft key; 3 = right soft key. Works on samsung rugby 4 SM-B780A. Is there a Romanian app like this? This language app is very helpful Thank you. is there any way you can get this app in french and german please? i have been searching high and low for an application that is easier for me to learn a new language.